In addition to hosting special event, Emory offers a wide variety of summer sports camps and learning programs for children and teens. For more information, visit the WorkLife Resource Center’s Summer Programs webpage. Summer will bring a busy schedule of activities to the Emory campus, as crowds of students make way for a season of camps, conferences, classes and special events. 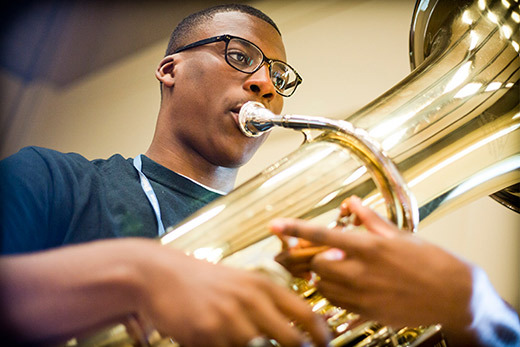 From an international gathering of scholars pursuing social justice research and a youth program shaping the next wave of Georgia’s leaders to a gathering of euphonium tuba enthusiasts and a bassoon extravaganza, the Emory campus will be bustling with summer visitors. Coordinated through the Conference Services division of Campus Life, the summer schedule offers an opportunity to utilize university facilities throughout the entire year, providing a venue for scholarly and community-focused events that complement Emory’s mission while showcasing the campus and its resources for prospective students, says Sherry Ebrahimi, director of conference services and housing administration. This summer’s events will draw thousands of visitors to campus, providing a stream of revenue and valuable hands-on experience for student workers, who help coordinate housing and activities and serve as liaisons to visiting organizations, she says. “We’re always pleased to be able to host national groups and international associations and are particularly excited when faculty members and campus divisions approach us for help in hosting those kinds of activities,” Ebrahimi says. The Barkley Forum, Emory’s award-winning center for intercollegiate competitive debate and debate education, hosts a series of summer debate camps and workshops for middle school and high school students. UNCF/Mellon Program Summer Institute, June 1-30: The Mellon Foundation will host more than two dozen African American undergraduate students interested in pursuing PhD programs to become college professors in the humanities, physics, mathematics, sociology, anthropology and other disciplines. Students from Emory and other institutions will work with top faculty to sharpen their research, writing and presentation skills, with a focus on interdisciplinary research. Emory Higher Education Institute, Student Affairs Certificate Program, June 4-7: Campus Life’s Emory Higher Education Institute hosts professional development opportunities for student affairs professionals and others from across the country. This year’s Student Affairs Certificate Program focuses on social justice innovation. Facilitators will share current experiments in applied innovation, lead innovation-generating exercises, and help participants develop social justice strategies in alignment with their institutional values, contexts and resources. 15th Annual International Euphonium Tuba Festival, June 16-24: Euphonium tuba enthusiasts from around the world will convene on the Emory campus for a week of motivation, inspiration and music-making. Internationally acclaimed guest artists will be on hand for performances and master classes, and participants will play with ensembles that range in size from four to 60 musicians. An outdoor performance will be held June 19 at the Emory Farmers Market. Festivities conclude with a gala concert. For more information, visit here. Emory Pre-College Classes, June 17-July 28: High school students seeking a preview of college life experience an in-depth exploration of compelling topics with leading Emory experts through two-, three- and four-week noncredit courses and institutes. Summer Bassoon Extravaganza, July 1-July 7: Participants join nationally recognized bassoon faculty and guest artists in a week-long camp that features chamber ensembles, a bassoon choir, special focus sessions and private instruction. For more information visit here. C5 Georgia Youth Foundation, July 8-15: C5 Georgia strives to help low-income students in metro Atlanta prepare for college by developing their leadership skills, from 7th grade through high school. At the Emory event, rising high school seniors will be presenting the results of year-long research projects devoted to issues that have had an impact upon Atlanta. SACAC Dry Run Conference, July 21-26: The Southern Association for College Admission Counseling will host an annual workshop designed to provide practical experience for new college admissions professionals with the help of seasoned industry leaders. International Society for Justice Research Conference, July 25-28: The 17th biennial ISJR Conference brings together a network of diverse scholars, representing a range of disciplines and countries, who work on justice-related issues. This year’s theme, “Interrogating Injustice,” will highlight issues related to race and the distribution of health care resources. The conference is hosted by Emory University, in conjunction with Georgia State University and University of Georgia. Conference sessions will be held in the Emory University School of Public Health. Plenary speakers include longtime civil rights leader Bernard Lafayette Jr., distinguished scholar-in-residence at the Candler School of Theology; Kimberly Jacob Arriola, associate dean for academic affairs and professor of behavioral sciences and health education at Rollins School of Public Health and a specialist on justice and health in communities of color; and Jan-Willem van Prooijen, associate professor in social and organizational psychology, VU University in Amsterdam, a senior researcher at the Netherlands Institute for the Study of Crime and Law Enforcement, and a noted expert on injustice, punishment and forgiveness.